Features and Benefits include: Instant On, 100 to 10,000 times faster at 1/10 clocking speed, Lower Power, Fewer Components, More reliable, Real time everything friendly, Immune to viruses, Bridgeable to x86 for extending legacy programs, Humble©. Hardware Unified Multiple Branch Logic Engine (HUMBLE©), attempts to convey the new architecture innovation and value thereof all in one word. Essentially it is a compression of the well known microprocessor and windowing operating system into one chip without re-using either in any way shape or form. We assert it is the first genuine and practical alternative toward extending general purpose computing. The HUMBLE© PC proof of concept, also known as the HUMBLE© PC development system provides tangible evidence today toward extending, including, and performing many things dreamed (for years by many). Background and details — The Humble© PC is based upon the same foundation which all computing engines rest. This implementation is a first introduction in this form. Quietly rethinking the whole past-present-future computing problem a new solution emerges . . . Learning from past and present technology and following wisdom as a guide, Humble© begins as such by removing the conventional microprocessor (uP) and conventional operating system (O/S) altogether. However, re-linkage to either or both as legacy-tandem options clearly remains possible. Thus, rather than presuming single, dual, or many microprocessors with exponentially increasing s/w complexity into an already burdened software time-multiplexed serial fetch-decode-execute architecture, Humble© performs these in complementary fashion thereby un-limiting the number of threads, un-limiting paralleling of applications, removing unnecessary coupling of time-multiplexed streams, achieving multiple execute-execute-execute, while exchanging exponential increasing complexity for linear, hence removing all the burdens, bottlenecks, and apparent brick walls. Humble© unifies threading, branching, scheduling, applications, etc. at the silicon level (rather than in disk-memory-resident-software) thereby producing 100s to 10,000s fold speedup coexisting with improved reliability and security (preventing virus entry altogether into the operating system, application programs and drivers . . .). Whilst these features and benefits are not possible in conventional software unified systems, they are possible in hardware unified systems. Advancement of technology slowly opened the window for this alternative during the recent 10 years. Utilizing a readily available (open) off the shelf general purpose field programmable motherboard, and an open language, the Humble© PC comes to life re-revolutionizing computing, minimally reminding us that solutions result from how well we have received Understanding (with a capital U). Present features and benefits are intended toward proof of these foundational concepts, and are not-limited by the concepts themselves nor by present technology. For example wireless features have not been implemented first as they are extensions of the basics. Hence wireless features are presently one of many opportunities for others to add. The application suite is also bare providing wide-open opportunity for others. In its present form, Humble© proves a better ‘core’ solution does exist now enabling true real-time-smooth-all-together-concurrency-fusion of multiple-forms-of-audio-telephony-television-gaming and computing including reliability, instant-on/off access, higher overall performance (bandwidth), lower power, and with much improved security, all built in. No new languages and no new silicon advances are required, rather a greater understanding of Understanding. Question – What is meant by Hardware Unified? Answer – A conventional uP and O/S performs its operation through software control of hardware. Therefore we assert the software unifies all operations. All commands and system status are input ultimately to software and all actions/results are consequences of decisions made in (by) software. Hardware unification allows user commands to enter directly into hardware with status and decisions made directly by hardware. Thereby relegating storage of instructions to a memory of any sort including hard disk (fetched to a memory-cache – decoded and executed) as a legacy-optional method. In other words history will begin to record that instructions no longer need to be fetched from memory (or disk) . . . when using a Humble© PC. Question – What is meant by Multiple Branch Logic Engine? Answer – Generally speaking, a conventional single uP with its O/S performs single branching wherein only the processor computes. From any one instruction to the next, the conventional uP and o/s typically can only branch from one instruction-point to another (within a program), or one instruction within a program to one instruction within another program. Humble© allows point to multi-point, process to multi-process, and program to multi-program branching wherein each may simultaneously compute with corresponding return. These are all performed without accessing a disk or memory for instructions (hence without associated delay). This kind of engine provides control for multiple concurrent io transactions and applications rather than multiplexing single io transfers and applications. Further, Humble© does not use a microprocessor nor derivative/variant thereof. NISC is a 2nd acronym helping describe Humble© further. See www.ecs-pc.com Frequently Asked Questions for a definition of NISC architecture with comparison to RISC and CISC. 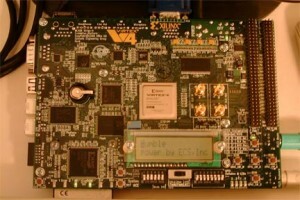 Question – If Humble© has no microprocessor what does it have? Answer – Humble© has hardware that includes wires, logic, flipflops, and small block memories, etc. that do not include a microprocessor nor soft microprocessor. So, Humble© may be likened to a ‘core’ breakthrough without a new (or old) microprocessor as the core. Humble© successfully re-describes time multiplexed software programs (from scratch so as not to infringe on prior art) as hardware programs reaping benefits thereof. In other words we have discovered how to write all functions of a personal computer into ‘hardware programs’. This is evidenced and demonstrable via the available development system. See www.ecs-pc.com Frequently Asked Questions for more information . . . The Humble© PC Development System features include – p/s2 mouse (3,4, 5 buttons) i/f, p/s2 multimedia keyboard (101,2,4) i/f, Dual ATA-6 ide (Hard Disk & CD-DVD-RW) i/f, Serial Port i/f (XModem, YModem, YModem Batch), 128G Compact Flash i/f, Floppy Disk i/f, 10/100/1000 Ethernet Phy, USB i/f, Linear Flash, 64|256MB SDRAM, 9|18Mb ZBT SRAM, Xilinx Virtex 4 FPGA, Calendar and Timekeeping program, Calculator program, FAT 32 File-Browser program, Point and Click Graphics, Triple DES keyed battery backup protected Non-Volatile Graphical Operating System, Support for user programs, Re-Programmability. Benefits of the Development System include – Practical alternative for all real-time and general purpose computing products, Hardware Unified Multiple Branch Logic Engine, Multiple simultaneous 100MByte conversations, Instant On|Off, 100s to 10,000s fold program execution speedup, Familiar Graphics, Point and Click User Interface, O/S and Programs immune from viruses, Seamless-Smooth-Fusion, and Lower power. Applications include – Personal Computers (Xilinx Virtex FPGA center-stage), Cloud Computers, Re-programmable System on Chip (rSoC), Communications (e.g. Cellular and Internet Telephones), Networking (e.g. Routers, Servers), High Complexity Robotics, All in one Integrated Automotive control , All in one Integrated Multimedia, Set-top-boxes, Voice recognition (in) and synthesis (out), on chip compilers, algorithm accelerators (e.g. fpga place and route accelerator, Java bytecode, JIT, and ahead of time interpreters), and a plethora of other embedded applications. Hence, we summarily describe it as — new, genuine, legitimate alternative, with very bare program suite, recognizable, useful, ready for general purpose application development, wide-open, humble and ‘a huge financial opportunity’. Development systems and Licenses are now available. The cost to reuse (license) Humble© is 99 U.S. dollars. The cost of a development system is 5000 U.S. Dollars. Humble also refers to our approach toward business. For more information, see our website at www.ecs-pc.com and YouTube video http://www.youtube.com/watch?v=i_v6IaD6-Ts Electronic Compute Systems, Inc. is a privately held corporation based in Towson, Maryland. ECS hopes to sell 10 development systems over the next year. 3Alpha Data Entry Services is an industry leader in data entry and processing services, global clients are taking advantages of highly accurate and time bound services of 3Alpha. 3Alpha provides data entry outsourcing services at affordable rates starts with USD 2.5 per hour. Data Entry Outsourcing to 3Alpha Data Entry Services – India based company provides various types of data entry and processing services with 99.99% quality assurance. With the years of experience and after handling various types of data entry and processing projects, 3Alpha has domain expertise in dealing any type of data and database. 3Alpha Data Entry Services having presence in three different locations to minimize downtime risks and provides non stop data entry services. 24 x 7 operation and single window communication helps 3Alpha’s clients to get uninterrupted services through out the year. In-house research team constantly looking for new ways to improves productivity and efficiency; they also constantly keep eyes on technology invention that helps 3Alpha’s team work efficiently. Click Consulting has created a new service helping small businesses understand the way that technology fits inside of their business, the CIO Assessment. After looking at the way technology was treated inside of their own client’s businesses, Click Consulting decided that they had to develop a system of connecting business goals and IT so that technology was no longer overhead but rather a driver of business. Most small businesses spend their time thinking about their business, not the technology that runs it. At the same time, most managed services companies just maintain the IT infrastructure without thinking about the business it exists within. Few IT service firms ever work with small businesses from a business perspective; instead everything becomes a maintenance issue so growth never occurs as a result of IT spending. Click Consulting decided that this downward spiral needed to stop. The CIO Assessment process starts with in-depth interviews of major stakeholders and decision makers at the company to understand the business choices that are being made. Then, after a deep inspection of the technology currently used at the company, Click Consulting delivers a report complete with suggestions about how to better align technology and the business. The assessment becomes a roadmap, helping guide the growth and profits of the company over time. Click Consulting is a full service IT and Web Development company based in Irvine, Calif. Focusing on small and growing companies, Click provides remote IT support, on-site tech support, self-managed websites, and fully custom web projects. Trusted by industry leading companies to manage their business critical networks and applications, Click Consulting specializes in Tech Support, Web Development and Computer Consulting. For more information, please visit http://www.clickconsulting.com/technicalsupport/cio-assessment. Click Consulting announced the launch of its Referral Partner Program. After a few months of testing with selected partners, Click Consulting has found the arrangement to be valuable for both the company and its partners, and is ready to accept new applicants for the program. The Referral Partner Program allows the partners of Click Consulting to sell their products, notably managed services, IT consulting, computer consulting, and web development services, and receive a 5% commission. Unlike other programs however, the 5% is not a one-time payment. The Click Consulting Referral Partner Program allows their partners to receive 5% of all services rendered to the referred client for an entire year (with a few minor exceptions). The partners only have to sell one time and they receive commissions for an entire year on anything Click Consulting sells the new client. If you wish to be part of the Referral Partner Program, simply contact Click Consulting for more information or visit us online at www.clickconsulting.com. Click Consulting is a full service IT and Web Development company based in Irvine, Calif. Focusing on small and growing companies, Click provides remote IT support, on-site tech support, self-managed websites, and fully custom web projects. Trusted by industry leading companies to manage their business critical networks and applications, Click Consulting specializes in Tech Support, Web Development and Computer Consulting. For more information, please visit www.clickconsulting.com. MultiFactor Corporation, an innovator in 2-way 2-factor authentication, Web application security and SSL VPN Authentication solutions, announces record fourth quarter growth of its SecureAuth authentication products, despite the slumping global economy. A contributing factor to SecureAuth’s continued market growth was the addition in the third and fourth quarter of native integration into Juniper SSL VPN products, CA’s SiteMinder and the IBM Tivoli Security Products. This complements very strong adoption for SecureAuth with Cisco ASA SSL VPNs, Microsoft Outlook Web Access, Microsoft SharePoint Server and all .NET applications. New customers were drawn to the automated simplicity of a truly strong dual factor authentication scheme. SecureAuth’s low acquisition cost and minimal implementation burden provided added incentive to move forward. MultiFactor Corporation is the leader in automated 2-way 2-factor user authentication. SecureAuth is a true plug-n-play multi-factor authentication mechanism that allows secure access into the enterprise network and application resources. MultiFactor Corporation and SecureAuth are registered trademarks of MultiFactor Corporation. MultiFactor Corporation, an innovator in 2 factor authentication, Web application security and SSL VPN Authentication solutions, today announced the integration of its flagship product, SecureAuth® and Data Guard Systems’ newest product, AlertBoot. AlertBoot transforms enterprise-level full disk encryption and data security into a fully-managed and centralized Web-based service. It promises customers the same benefits as a traditional full disk encryption and data security solution, but on a platform that is scalable to the needs of an organization and requires far less investment in IT infrastructure, support, and training. SecureAuth revolutionized X509 certificate technology authentication into a tokenless, non-phishable, two-way authentication solution that can be effortlessly deployed over the Web and requires virtually no training or infrastructure modifications to implement and manage. The solution proved to be a perfect match for the type of multi-factor authentication system AlertBoot needed for AlertBoot Central, its administrative console. SecureAuth works by authenticating both the user and the client for each session via a non-exportable cryptographic credential. When an authorized user logs into AlertBoot Central for the first time, they’re immediately redirected to the SecureAuth registration system, which emails them a PIN. Once they enter the PIN, the system installs the certificate on their computer. From that point on, whenever the user logs into the AlertBoot management console, they’re instantly authorized. The end result is that the user and customer both enjoy the full security benefits of X509 certificate technology authentication, but without the additional infrastructure that would have otherwise been required. MultiFactor Corporation is the leader in strong, simple to use, user authentication. SecureAuth is a true plug-n-play dual factor authentication mechanism that allows secure access into the enterprise network and application resources. Enabling the enterprise to cost effectively harness the true power of the network. Please visit http://multifa.com. MultiFactor Corporation and SecureAuth are registered trademarks of MultiFactor Corporation. The new Zoom Player v.6 products form the most advanced and capable performers for any mission that involves processing, display and control of Digital Media on any computer – from Media Center PCs for entertainment, High Grade Home Theatre Systems for the ultimate HD video and DVD experience or professional to Digital Signage Systems for commercial applications. 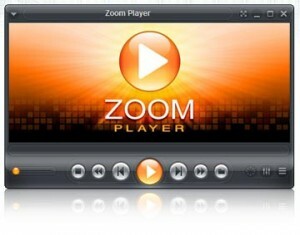 New Zoom Player v.6 brings three new product lines: Business Edition, Home Edition and Zoom Player Mobile. DS was created specifically for serving Digital Signage applications. It processes and displays any combination of media files in any screen formation. DS drives any type of display from indoors screens to outdoors electronic billboards and it can use one or multiple display areas concurrently on one screen or across a cluster of screens. Business Edition DS offers unparalleled performance, perfect stability under any condition and the level of support you need for professional Digital Signage projects. MC is the perfect Media Processing, Playback, Control and Management software for entertainment PCs, from high grade Media Centers to top-notch Home Theater PC Applications. It offers perfect reliability and delivers the highest levels of performance, usability and configuration flexibility that just until recently were part of only the high-cost professional entertainment hardware-only gear. FLEX is the ultimate, all-inclusive toolset for professional users who will not compromise on power, performance or features and demand the best in all categories. This “Swiss Army Knife” for media processing, display and management combines all the best and most powerful features, functionality, playback and display options, configuration options and navigation interfaces of MC and DS models. Premium comes with a host of additional features such as DVD Password Protected Parental Control, full DRM Support, Closed captions, Scene-cut editing, Display over multiple monitors, Enhanced playlist management, Safe navigation mode, File download tracker and many more. MAX is for serious, no-compromise users looking for pure playback perfection, total control of media files, the latest in video and audio processing technologies and the maximum flexibility in usage and configuration. Zoom Player Mobile v.6 is a special version of Zoom Player for portable USB U3 based devices (U3 Flash Drives) designed for people on the move who need their reliable and familiar media player with them at all times. With a small footprint, extremely fast response, top reliability and most of the features of its big brothers, Zoom Player Mobile is THE top choice for all media playback tasks while away from home or office. Superseding previous Zoom Player products was not an easy task for Inmatrix and they have worked hard to provide the most advanced and up to date software products. The result is three product lines with the most capable and affordable software of its kind, intended to handle any type of professional media processing, playback and management task that can be utilized for either personal or business use under any MS Windows OS. CM-Consult and rational-tools.com has released a demo version of their UML2ClearQuest module for free download. The module is located at the company’s site and is accessible at http://www.rational-tools.com/uml2clearquest.htm. UML2ClearQuest is a software product that has no analogues for IBM Rational ClearQuest. The UML2ClearQuest solution allows for creating and modifying the lifecycle of IBM Rational ClearQuest record types based on UML diagrams (up to version 2.1). The program is designed first of all for IBM Rational ClearQuest managers, responsible for designing schemas for their organizations. • Importing UML states from MS Visio and StarUML. Design business processes with the comfort of MS Visio,and StarUML and readily import the results to IBM Rational ClearQuest to a new or existing record type. • Visualizing the import data. Before importing, the module shows the state diagram and checks it for compliancy with the IBM Rational ClearQuest state machine. • Exporting state machines for record types from IBM Rational ClearQuest. Allows for exporting IBM Rational ClearQuest state machines to UML diagrams in MS Visio or StarUML format for modifying and viewing. A modified diagram can then be imported to the existing record type from which it was exported. • As an IBM Rational Software Architect plugin. This modification allows for importing and exporting projects only from IBM Rational Software Architect. The demo version allows for exporting diagrams to IBM Rational ClearQuest only if it has no more than 3 states. CM-Consult was founded in 2004. It’s primary business activities have been project management consulting, supporting and implementing IBM Rational instruments, and supporting IBM Rational and Microsoft software. CM-Consult is one of the five leading consulting companies in Russia that implement IBM Rational tools. It’s employees have had experience with more than 25 successful projects with implementing IBM Rational and Microsoft, and over 600 specialists have been trained in Russia and the ex-USSR. CM-Consult is an Advanced IBM Partner and has the Value Advantage Plus (VAP) status. The company’s core employees are all certified professionals and experts, with vast experience and knowledge.